I may not born with creative mindset but I think I can be more creative if I mixed with artistic people, exposed myself with innovative products, music and arts or get a proper guide on how to train my brain to be creative. Do you know that this is possible! 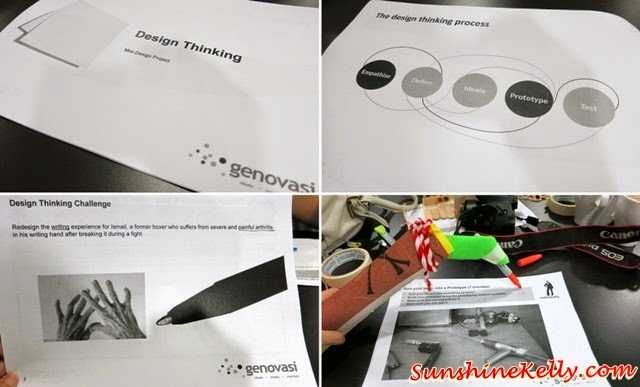 Recently I attended a session of The Design Thinking Teaser by Genovasi. I believe creativity and innovation can be trained and cultivated. On Saturday morning we gathered at the Genovasi headquarters in Petaling Jaya. I was quite curious about the creative thinking training and group exercise that we will go through to understand the basic fundamentals of the Design Thinking methodology. It was my first time at there, the spacious, cool and modern inspired training centre was awesome. Well, we toured around the training centre and Azman Ismail, Innovation Alchemist (programme manager) briefed us about the Genovasi journey and mission. Genovasi started in 2012 basically is to inspire, create and empower a movement of innovators for the betterment of self, environment and the world. 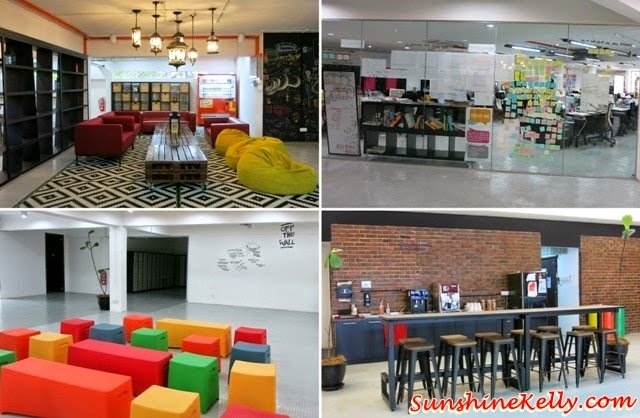 Then opened its doors in February 2013 aimed to promote an innovation culture through its education and training programmes. Then we gathered in a classroom to kick start The Design Thinking Teaser session by Azman. Wootz! So this was our Design Thinking Mini Design Project handbook. It’s a brief and simple one as our guideline to complete our project of the day. The Genovasi Way always focus on human, innovation happen when these three elements - desirability (human values), viability (business) & feasibility (technology) combined. There are 5 Steps of Design Thinking Process, so we have to go through each step in order to derive to our final design project. It started with Empathise, Define, Ideate, Prototype and Test. We were taught basic design thinking steps in order to tackle the mini challenge. Let’s start! I am getting excited, so our Design Thinking Challenge is to redesign the writing experience for Ismail, a formal boxer who suffers from severe and painful arthritis in his writing hand after breaking it during a fight. We were given some time frame to brainstorm to design something meaningful and useful to help to ease Ismail. We taped our fingers with masking tape and tried to write to feel Ismail’s situation. Then shared our ideas with our friends on the same table then choose an idea and start designing. I decided to design a voice command electronic arm for Ismail, he just need to speak the electronic arm will help him to write. Ok then we started to turn our ideas into Prototype in 7 minutes using the material that were provided such as sticky note, stapler, pin, colourful strings, markers, wood spatula, colourful cloths, paper and many more. We had fun creating my own Prototype, in such a short time we managed to come out with so many ideas and Prototypes. Finally all the participants were completed, then we discussed about why we choose the idea and how our Prototype can help Ismail to write faster and smoother. The last steps is to Test our Prototype if it’s possible. The good thing about Prototype is that it is low cost and if it fails or not suitable we can start all over again without wasting too much time and money. Design Thinking Teaser session was fun at the same time stirred our mind creativity and start to think out of the box. It is a systematic way of approach to encourage our brain to think and be creative and continuously brainstorm can lead us to think out of the box. Let Design Thinking refine our innovator skills. I believe that we can learn to innovate. Genovasi also offer the Innovation Ambassador Development Programme (IADP) to learn a methodology that empowers you to solve real world issues confidently.